Humana has some cool stuff planned for the Taste of Chicago, which kicked off today. If you attend, be sure to stop by their tent. They'll also be hosting a healthy food cook-off between Chicago Bears alum Tom Thayer and WXRT DJ Mary Dixon at 12:30 p.m. CT on Saturday, July 11. The cook-off will feature special guest judges, including fellow Chicago Bears alum Tom Waddle and WXRT DJ Johnny Mars. 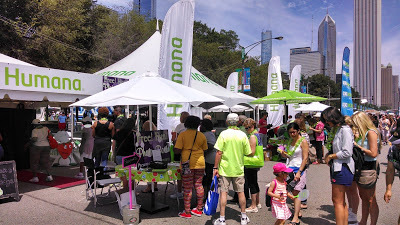 Also, if you are at the fest and looking for something on the healthier side, Humana has identified 55 healthy food options that will be identified with a green apple image on menu boards. Take a peek and some of the better-for-you options that you'll find there. They also have identified vegan and gluten-free offerings.